Thermography is a printing process by which heat is applied to a powder that covers a non-drying ink. The ink and powder solution is placed on the paper stock and run through a conveyer at searing temperatures to force the ink to dry and harden. The result is a raised print effect that our customers love. Thermography is the common choice of many attorneys, doctors and financial institutions. The raised print effect is subtle and elegant. Thermographic business cards are also a popular choice for new entrepreneurs. A simple black and white raised print business card is inexpensive and can sometimes take just a day or two to turn around. Matching letterhead and envelopes usually take a few extra business days. The letterhead is treated with an invisible laser-safe coating to allow the raised print to safely pass through your laser printer without streaking or damaging the raised ink. Another common use for thermography is the announcement. Weddings, baby showers, birthdays, anniversaries and corporate events are all occasions to use raised printing for invitations, RSVP cards, directions, donation cards, save-the-date notices and more. Choose from a selection of paper stocks and raised print ink colors. 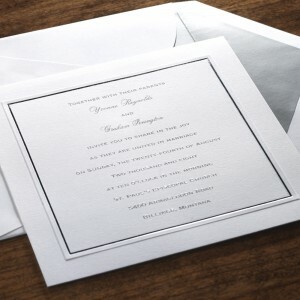 Interested in other options for invitations apart from thermography? Visit our social announcements online store.